Producing fake evidence to provoke an attack on a foreign country or planning to assassinate a head of state to overthrow his government is sleazy and criminal. What kind of man asks the favor of a foreign government to be an accomplice in such criminal behavior? 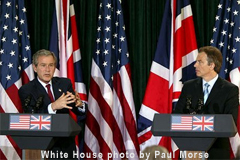 What message are the United States and Great Britain sending to the world?